As parents, we dread the stubborn child. She over-commits to her favorite pair of pants. He refuses to taste tonight's dinner. They dig in on their first impulses, refuse to listen, and squander precious time. Stubbornness, deployed in this childish way, is selfish, short-sighted, and immature. Sadly, it's exactly this behavior that's become a fixture on our national stage. Our country is so conflicted, so deeply entrenched in its divisions that we no longer hear each other, much less seek to understand. These conflicts over our national character threaten to tear us apart. Most of us are – intentionally or not – acting just like that child at the dinner table, fingers in his ears, eyes closed, nose turned away from the broccoli he believes he despises. As this tumultuous year draws to an end, I find myself depleted and adrift as a parent, a person, and a citizen. I'm hearing the messages from thoughtful leaders across the nation: come together, build bridges, find common ground. But this hardly sounds like useful advice. How exactly will we come together – and who's we? How do we build bridges strong enough to weather our stormy disagreements? How can we possibly recognize common ground amid the debris of distrust, accusations, and false information? I've concluded that my way forward in 2017, and possibly yours too, involves a great deal of stubbornness, though not quite the kind deployed by our children at the dinner table or by our leaders in congressional stalemates. If being stubborn makes you cringe, think of it as bold determination. Let's admit that stubbornness can be a gift. I know, I know. Compromise is an indispensable tactic for peacemakers. Stubborn pursuit of a well-defined goal is the surest path to success. Harnessed effectively, stubbornness helps us hold tight and move forward against the forces that always seem to make us fall short. Indecisiveness. Not enough time. That nagging feeling of inadequacy. When these forces threaten to make us move on or stand down, stubborn will power can see us through. Being stubborn, in just the right way, can help us make a big-hearted impact in our communities and beyond. Gather your family and join me in applying stubborn determination to a few crucial, big-hearted resolutions. Resolve to be stubborn for the sake of kindness. 1. Stubbornly show up for your community. Build your community: your real, living, breathing, often-conflicted community. It takes a great deal of resolve to stay committed to showing up when a cozy night in is calling your name. Showing up helps us build diverse, real-world relationships. These interactions increase our resilience, as well as our compassion. Literally, show up. Attend community events. Show up to school board meetings and local governance associations. Be an active voice in your community. The more we show up, the more we will recognize the immense impact we can make on our local area simply by getting involved. Join or start a book club. Discuss big ideas and form new friendships through a local book club. Do good, together. 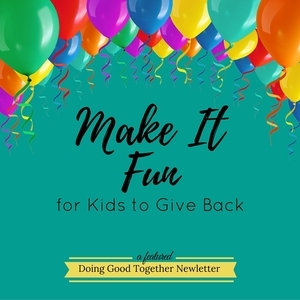 Bring families together for a service project or act of kindness. Or attend a service event in your area. Consider how you might apply Elizabeth Lesser's TED Talk advice in your own life and "Take the 'Other' to Lunch." We know too well how easy it is to rest comfortably in our own world view, and to lead our children along that same path. Practiced curiosity fills our world with wonder (as I mentioned last summer). More importantly, curiosity is the engine that leads us to new discoveries, new observations, and even new friendships. Listen well. Now that you're showing up for your community, you'll naturally fall into conversation with those around you. Probe for deeper understanding by listening closely and asking probing questions like, "Tell me more about that" or "What do you mean by...?" Be thoughtfully, but stubbornly, skeptical. Review these great articles, "Fake or Real? How to Self-Check the News and Get the Facts" from National Public Radio and "How to Spot Fake News (and Teach Kids to be Media Savvy)" from Common Sense Media. Make time to let your mind wander. Curiosity blooms is in a wandering mind. Take a walk. Take a nap. Make space in your life to wonder and reflect. 3) Read widely, and with persistent stubbornness. In this media-heavy world, it takes a great deal of intention and determination to make progress on your reading list. The library stack on my bedside table is reaching dangerous heights, while the list of articles I've saved from Facebook (particularly DGT's own compassion-filled feed) are adding up faster than I can tackle them. I've decided to buckle down and plant myself on the couch for some small portion each evening. It's enjoyable, restful, and thought-provoking. Plus, our children are more likely to thrive academically when they see us read. It's really a win-win. Find book buddies. Make reading part of your determined, community-building efforts by forming a big-hearted book club with a small group of families. Check out Give your Child the World: Raising Globally-Minded Kids One Book at a Time by Jamie C. Martin. This book will help you make every library visit a world-changing event. I'm a sucker for books about books, and this one is my new favorite! Don't let kindness fall off the calendar! This takes determination. It's hard to say no to the "just one more thing" our child or spouse (or self) wants to do this weekend. But we'll all feel better, live better, and do better if we make time on a regular basis to meet the needs of others. This year, my family joined the Box Project, making a monthly commitment to support a family in poverty. What good does your family have planned? Feel free to share your ideas or goals in the comments! Find your next service project. Browse our collection of service projects at home, or sign up to receive our monthly listings of family-friendly service projects around the country. Make a date! Set a regular time each week or month when your family can focus on compassion. Whether you are completing a simple project, reading a big-hearted book, or simply launching a thoughtful conversation, making kindness part of your regular routine lets your kids know that helping others is a family priority. 5) Join our Big-Hearted Families Membership Circle. Join our community of parents committed to kindness. We'll make it easier to stick to your big-hearted goals, even as the busy weeks start to slip by too fast. If we stubbornly commit to making our communities more connected, more compassionate, and more thoughtful, a few hopeful things will happen this year. We will form new friendships. We will start new conversations, and perhaps wrestle with challenging, puzzling, and fascinating new ideas. We will build bridges of hope, service, and compassion to folks in our community and beyond. And with stubborn persistence, we just might discover common ground. Let's be stubborn about creating kindness in the new year! 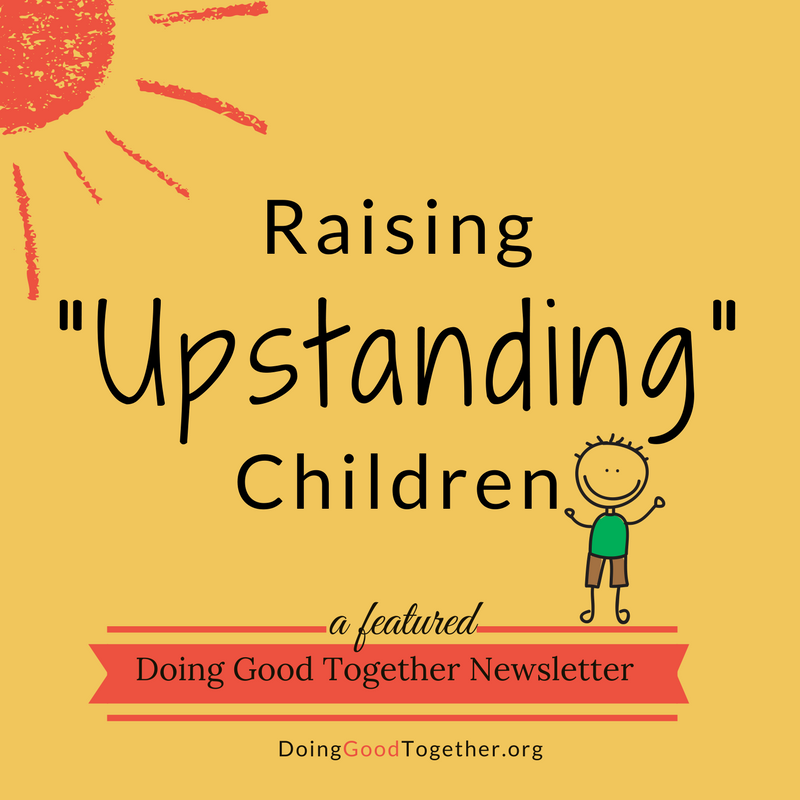 Discover more big-hearted ideas in these Doing Good Together Newsletters.